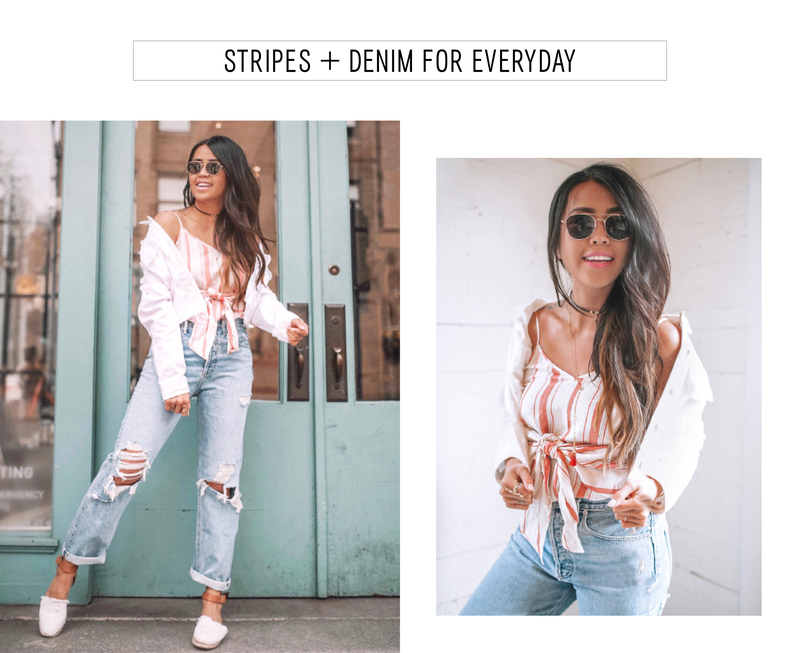 This week, Sabrina Tan (@gyspytan) of GypsyTan.com puts her typically eclectic spin on some of spring’s best staples: stripes and florals. Tan spent her childhood all over the world, collecting references and styling tips which she shares with her 150K Instagram followers daily. With that in mind, we asked her to reimagine flowers and stripes for us and she did no disappoint, see her tips below. It never fails: Spring rolls around and floral and stripes are taking over the fashion industry once again. (I can practically hear Miranda Priestly rolling her eyes.) While florals and stripes for spring may not exactly be a groundbreaking idea, there is a reason why these prints will never go out of style. 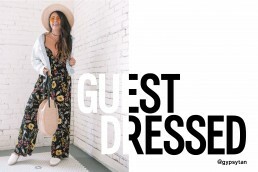 With the help of Express, anyone can refresh—and nail—this spring trend! 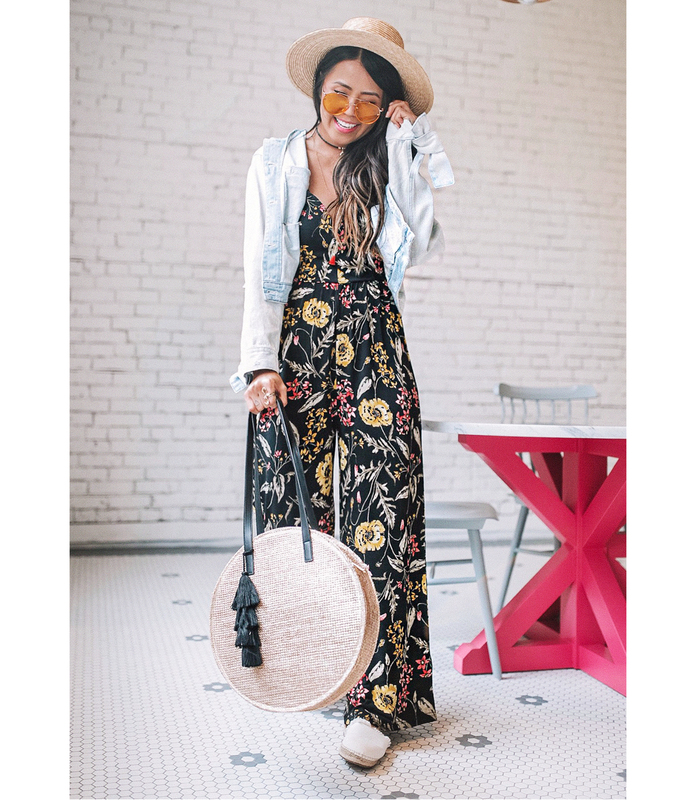 From jumpsuits to kimono, here are three fresh ways you can adopt these spring prints without looking outdated or like your grandma’s wallpaper. Floral jumpsuits can make a serious statement. But if you’re looking to tone down floral prints for your casual weekend wardrobe, the right accessories and proper layering pieces are key to making it right for any occasion. I instantly fell in love with this floral wide-leg jumpsuit the moment I put it on. The cooling fabric, cinched waist, and sweetheart neckline make this piece so flattering. Since spring weather is known for being finicky, I always have to carry a jacket with me. I opted for this light denim jacket with unique tie sleeves to keep it casual. I paired the whole look with a round straw tote, straw hat, and espadrilles (similar here)—perfect for sunny weekends with friends and family! Tip: Wear this exact jumpsuit with a blazer and heels for work or date night! Simple. Yes, mixing prints are fun, but for an everyday look denim and stripes is a perfect go-to combo for spring. This striped cami with linen blend material will keep you cool and it ties in the front for a fresh, feminine look. I paired it with a white cropped denim jacket and high-waisted girlfriend denim (similar here) for cool, casual-chic vibes. Tip: For warmer days, wear it with denim shorts. If you’re lucky enough to live in a place where spring weather is like summer or you’re about ready to take a beachy vacay, this floral print cover up is a must! The light flowy fabric is perfect for warmer days. I paired with these adorable high-waisted denim tie shorts and eyelet cami. Or pull it on over a bathing suit at the beach. Which of these looks is your favorite? What other trends are you most excited to try?